I never thought I would say this… but… I think I have too much wool. I know! Incredible! I packed my suitcase to come back to Dublin today and three quarters of it was full of wool and wool-related books. I think I may have finally crossed the line. My parents got back from holliers last night. I asked my mum that 1. only if she was in the area and 2. if they weren’t more than e30, to call into this wool shop and see about some plastic, see-through wellies I’d seen while I was in Berlin (they passed through Berlin, you see). I figured it would be a long shot. Anyway, since my Dad’s the one with great German, he found the shop. He told them I’d been there (I’m positive they remember me. I was in there twice, and the first time I’d been examining felting needles up really close and a woman came over and I’m pretty sure she told me not to poke my eye out in German. The second time, I had the woman climbing on a chair and ladder to get the colour of mohair I wanted down from above the shelves. Hey, I bought it, didn’t I? I don’t feel bad and she didn’t fall :D). He asked them about these fabled see-through wellies. They just stared at him and said, where did she see them? We haven’t had them in stock for ages! 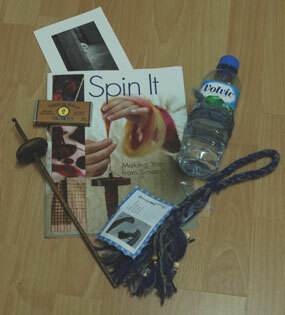 In fact, I was rooting through this basket under a sewing machine which was under a box of something or other. I thought it might be discount sock yarn but all I found was one see-through welly. Thus the quest began! Anyway, one woman went out the back and was there for ages (this is ages in Dad-Time. Ten minutes is just a drop in the ocean for me when standing in a wool shop)… but managed to come back with their only pair… that just happened to be in my size lol. My Dad asked, well, how much? And the woman who found them went off and asked, and since they were a bit beaten up looking (so she said; to me they look fine) he got them for e8.95 Horray! They are fabulous and I can’t wait until it rains so I can wear them and show off my Pomatomus socks. I brought them with me back to Dublin… but I don’t have my camera so you’re just going to have to imagine again. I think I will bring a little disposable camera to the Electric Picnic and take some snaps for the social pages Stay tuned! I won’t be back until Monday. Hooraah I am in Dublinia! Just a quick stop-over but it is lovely to get reacquainted with my piano (I’m sure my neighbours think it is less lovely) and know that in a little over a week’s time, I will be back here doing my thang. 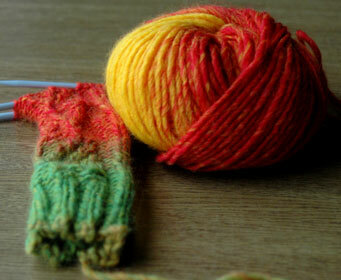 But in the meantime, I have been alerted to the Library Bar knit-meet tomorrow afternoon! Joy! I will actually be able to make it! I am dead happy about that – plus I have lots of knitting to do with me. I am also getting very excited about going to the Electric Picnic. 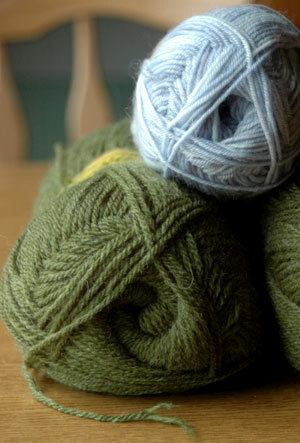 There will be lots of knitting there at the Knitted Picnic and it is the first time I will have camped at a festival! I have been to Witnness and Oxegen a few times but always got a weekend pass and bussed in and out. Those times, I was seriously intent on seeing most of the acts, and if I recall correctly, we only had one beer apiece at most of them This time however, even though I really dig alot of the act I know that are playing, I’m really just looking forward to getting into the proper festival atmosphere – one last knees-up before the winter. 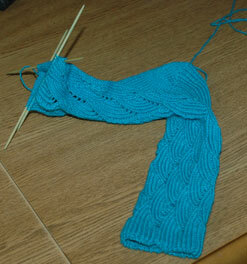 It’s been very start-stop on my Unprouncible sock, but I’m getting there. It’s been nice weather the last two days so I’ve been going to a small park beside the Cathedral in town with my knitting. Today I got over-eager and started decreasing for the toes an inch too soon! 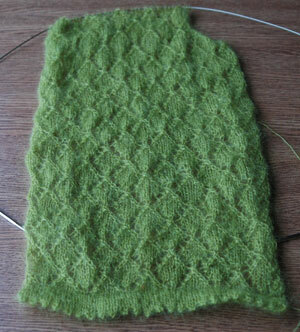 So I had to rip back when I got home and reknit it. I am just about to start the toe shaping again. It’s looking good though! 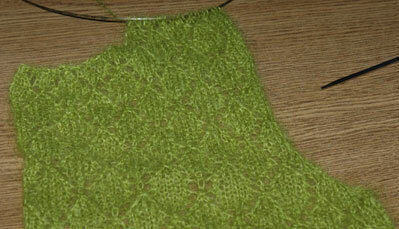 Many people stop on their way through the park to remark on my knitting, how nobody does it anymore, and a sock! of all things! Is it yourself it’s for? I am going up to Dublin tomorrow evening for a lesson on Saturday, so I’m hoping to get lots done on the round trip! My Secret Pal emailed me there during the week and mentioned that there is a Sheep and Wool festival on in Ballymena, Co. Antrim, this weekend over August 25th and 26th. I wish I could go! If I was still living in Dublin, or even staying the whole weekend I would probably take the train up and hope for the best. 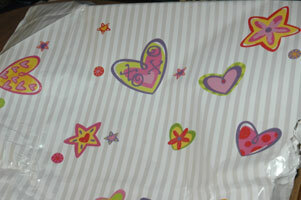 The best details (ie patchy) I can find about it are here. If anybody reading this goes, do please let me know what it is like as I would be really interested in going next year. As promised! Here is a goo at some recently acquired stash. 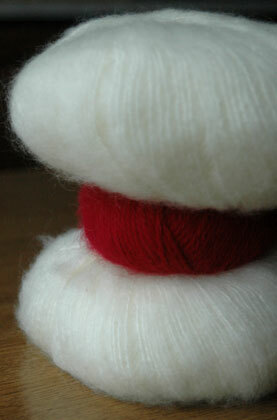 Here is the gorgeous off-white mohair I was on about – Sirdar Blur. 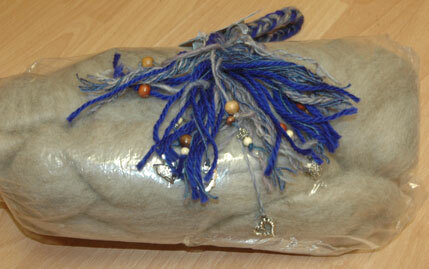 It is 30% mohair, 70% acrylic and it is wonderfully soft. If you love the fluffy quality of mohair but don’t like the scratchiness, this is a really good medium. I don’t like the patterns they’ve got for it, but there are loads of things in past Rebecca and Phildar magazines that you can use it for. The jam in the middle there is a little ball of angora. 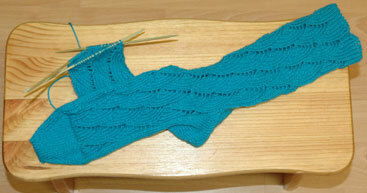 It is Adriafil Carezza, 70% angora, 10% wool and 20% polymid. It is deliciously soft but it was too expensive to buy any amount of it. To me, it is souvenier yarn of a lovely afternoon and trip out to Cliffony with my mum’s friend Mary. Last but not least, here is a funny book that I picked up in an even funnier little bookshop in Sligo today. Since I am finishing up on Friday week, there is no point in me working up time (long story – it’s to do with Flexitime), so I have been taking leisurely lunch breaks. Today, I decided to visit this shop which is a little bit out of the way. 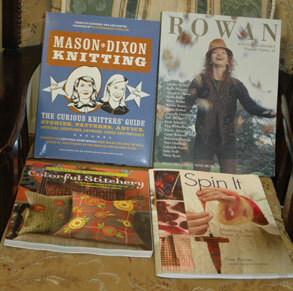 Such bizarre books on cross stitch and machine knitting! Unearthed from somebody’s granny’s house from the 1800s no doubt. 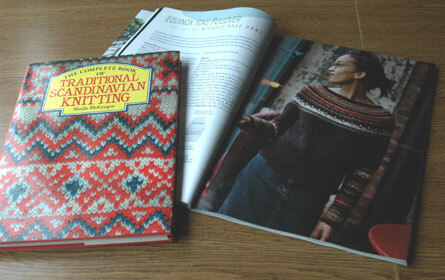 Anyway, I dug the book on Traditional Scandanavian Knitting, which for e6.50, was pretty good value. I have been mysteriously drawn to the wonder that is Scandanavian Knitting recently – see picture from this Autumn’s Interweave Knits! As I said in my last post, I am unsure whether this is a style that would suit me. In my mind, I team a jumper like that up with a dark wool or denim skirt, black tights and funny shoes. I’m still not convinced though. 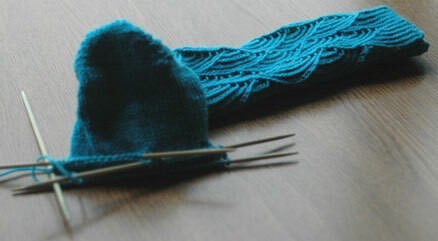 The unpronouncible sock is fast turning into the unmentionable sock: I have gone awry yet again! I did manage to rectify my error but now I have two stitches more than I should. I’m never one to give up in exasperation but this one is staying in my knitting bag until I develop the steel needed to sort this one out. Oh woe! I’ll have to knit another one to match! As for ye olde Grannee Smithe, I ended up not having to rip back too much and got cracking on the armhole shaping like there was no tomorrow. However….. I chose to temporarily disremember that a Left Front should only have one armhole shaping Here is the correct, well-reprimanded, Left Front. I’m going to splash out on one last pile of books before my money runs out and I’m back to college. I have a good bit saved up for college now so I don’t feel so bad about it! I have been stockpiling for the the long and poor winter ahead.